If you're a regular reader of Vacant Lake, you're probably well aware of my aim to educate on the idea of easy upcycling. 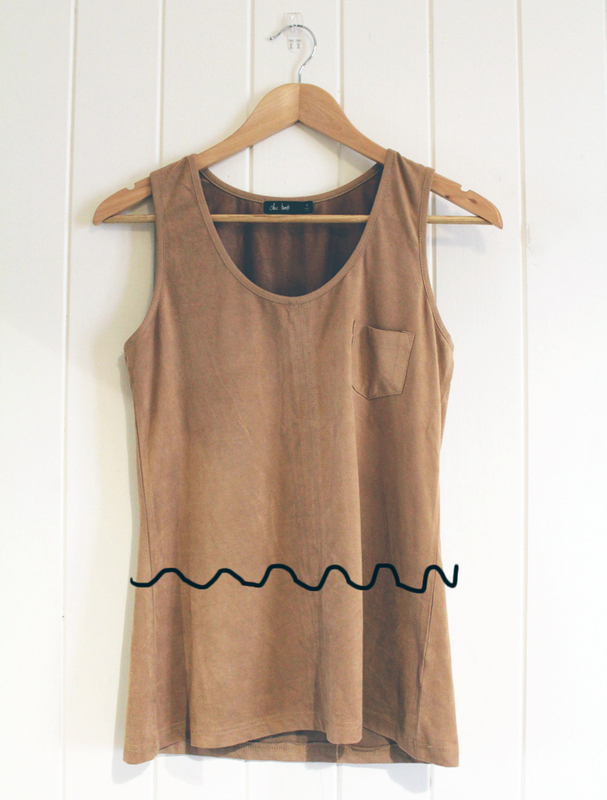 About a year ago I bought this faux suede shirt from Chica Booti and six months later I hated it, and it was in storage. Last week I pulled it back out again with the idea of cutting it shorter. Although, rather than a straight edge, I decided to shake it up a bit by creating a scalloped edge by cutting along the line (yeah, it's pretty dodge, I know) I've drawn on the image above. 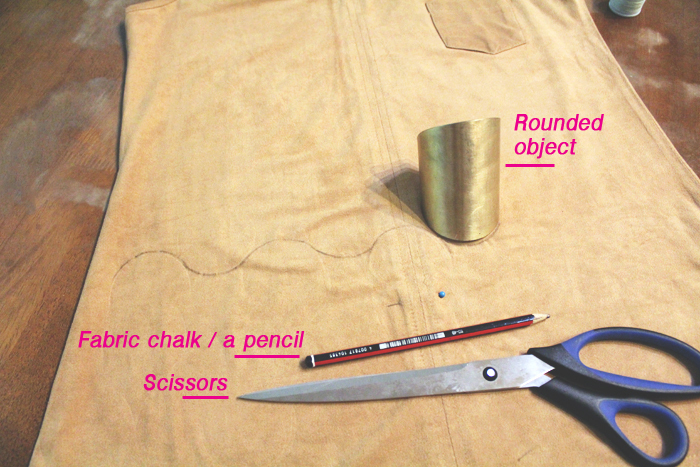 While wearing your top, work out how much of the length you want to cut off and mark a line with fabric chalk. To create the edging I used a cuff (it happened to be the nearest round object of the right size) and marked along the edge with a pencil. If you have fabric chalk, it's a better option incase you make an error in your markings. Then cut along the line with a pair of sharp scissors (smaller ones are better for cutting a clean curve). Go back with your scissors to smooth out any jagged edges. I'm possibly still not finish with this one, though; I'm thinking of reshaping the straps and I'd love to do some small flower cut outs along the bottom (but that's pretty difficult if you don't have the right tools). 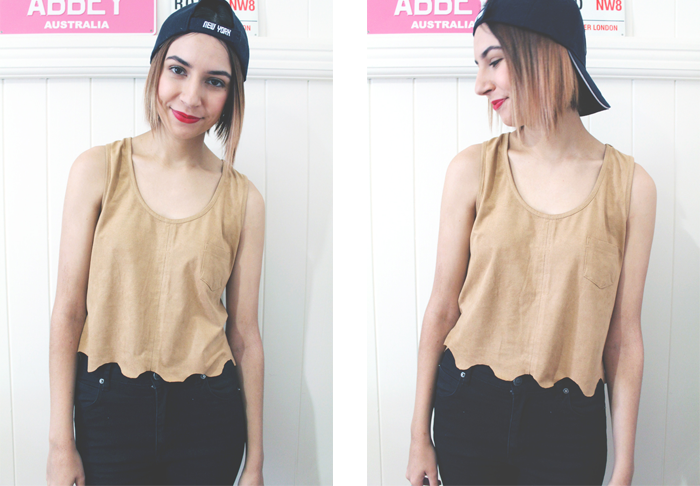 But for now, this is what I've come up with and I'm definitely going to be wearing this top again. I also re-shaped my 'muscle top' from my last post; oops. If you want to check out what it looks like now (and it's way better) like Vacant Lake on Facebook or follow me on Instagram to take a squiz. This looks really great!I loved the top before it got cut, but I loe it even more now! Great DIY.